Any way to have the accu weather app give you weather alerts? I see nothing in the settings. I use Accu Weather and the alerts are visible when the temperature text in the top status bar turns red. 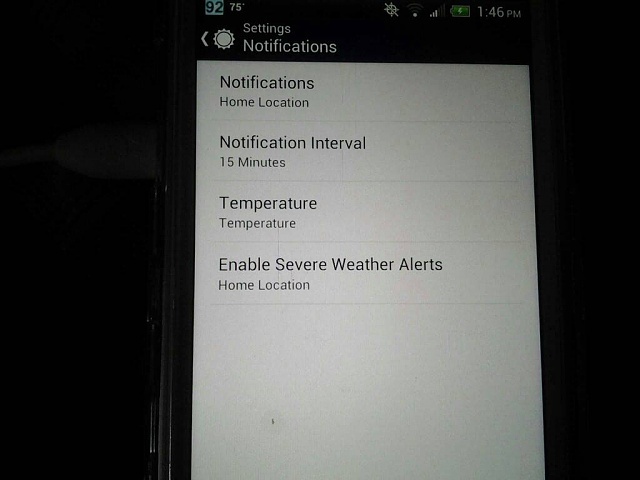 If tap settings, notifications, Enable Severe Weather alerts. Make sure home location is checked. You should get alerts when they happen. Thoes settings are not on this app. Interesting. I just realised that I am using the paid version accu weather plus. That may be why you don't have the settings for alerts. Somewhat related. I just installed the paid version of Weather Bug. I had the free version and loved it except for the ads (which can cause a security risk, but not always). I'd always used Accuweather in the past but find Bug to be a nicer UI and more accurate. World Weather Online Free and Premium APIs provide a way to get weather and marine data for current, past, and forecasted future times. The APIs deliver advanced and in-depth weather information using standard HTTP requests, returning data in easy to use formats like XML, JSON, JSON-P, comma-separated values, and tab-separated values. They are used worldwide by travel agents, marinas, sailors, ski fanatics, airlines, mobile companies and website owners. Unlike other weather content providers, we generate our own weather forecast, so we do not rely on third parties for weather data. The Free API provides current and limited forecast data, as well as some utility calls. The Premium API provides more forecast data and historical data. Getting Started. Step-by-step instructions on how to get started with the Free and Premium APIs. Frequently Asked Questions. A FAQ with information about both the Free and Premium APIs, as well as information about weather data. Usage Policy. Information on how the API should be used. API Reference. Detailed reference material about each request and response. I have checked the link and Yes the best one..